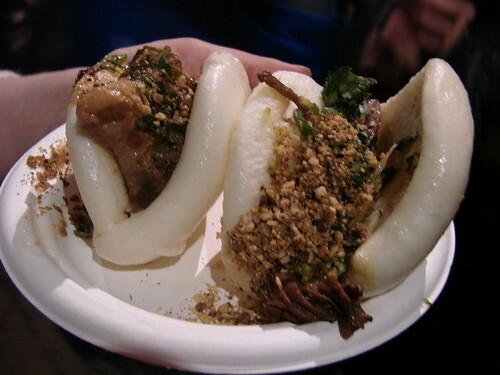 Longest wait but still worth it bite...the Chairman Bao from Baohaus. Niman Ranch Pork Belly served with: Crushed peanut, cilantro, Haus Relish, and Taiwanese red sugar. Mmmm...pork belly. 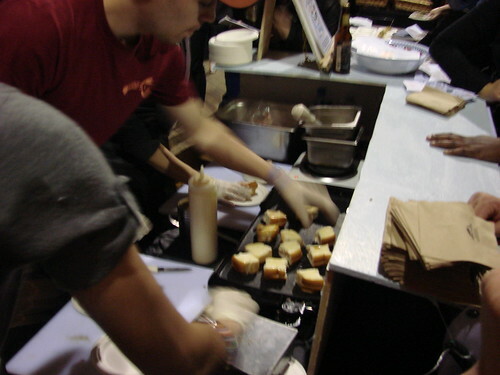 Even early into the night Baohaus was a madhouse. A snaking continuous line formed fairly quickly for the baos that the Village Voice said "might even be better than the one at Momofuku." 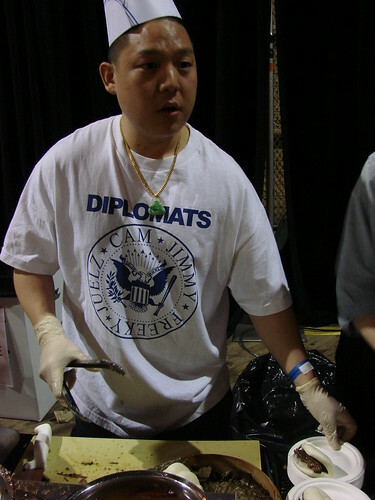 As I approached the front of the line a middle aged couple sidled next to the person in front of me and managed to score some baos circumventing the entire line and alerting the attention of the people at the end of the line who rushed the front thereby angering the people at the front of the line. Words were exchanged and it was getting a little nasty. With bao raised above my head I escaped the melee relatively unscathed. The bao itself was delicious. The pork belly melted in your mouth and the red sugared peanuts gave it a lovely crunch and sweetness. I'm going to have to drop by their Lower East Side Location soon. Last year we couldn't get enough of Motorino's bomboloni. 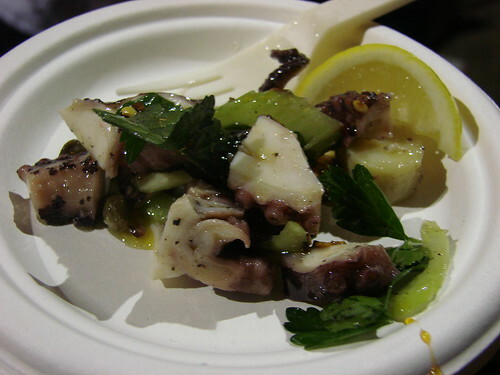 This year they went the savory route with an octopus salad. After some pretty meat intensive dishes, this was light and refreshing. I'd be lying if I said I only had one serving. Patacon Pisao a Venezuelan restaurant out of Elmherst who also has a truck in Inwood represented with a Tres Leches cake that was out of this world good. Usually tres leches is too sweet for me, but this one is worth the trip. You can get more of a taste of their full menu over at Edible Queens. I sense a field trip coming on! Del Posto brought the Chocolate & Olive Oil Bastoncinos that we so enjoyed at SWEET this fall. It was basically a little gelato ice cream pop covered in chocolate and bread crumbs. Like a sleek and sophisticated Italian take on a Good Humor Bar. I wish I had the good sense to grab more than one of these before it disappeared! 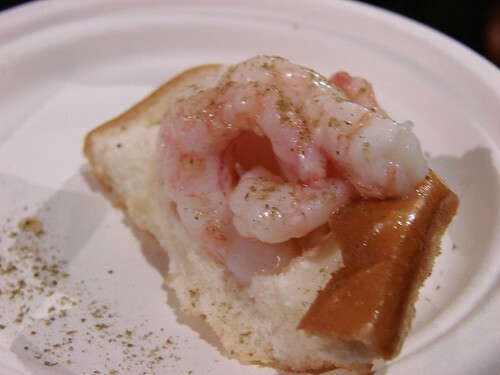 My favorite bite of the night was the shrimp roll from Luke's Lobster. What can I say? Maine runs deep in my soul. The traditional split topped rolls were griddled right before serving and topped with a squirt of mayo, a butter and stuffed with delightfully chilled fresh Maine shrimp, which if you've never had them are smaller and sweeter than your typical farmed variety. Needless to say Luke's booth was mobbed the enitre night. I haven't had a chance to visit Luke's in the village yet, but I definitely will soon. 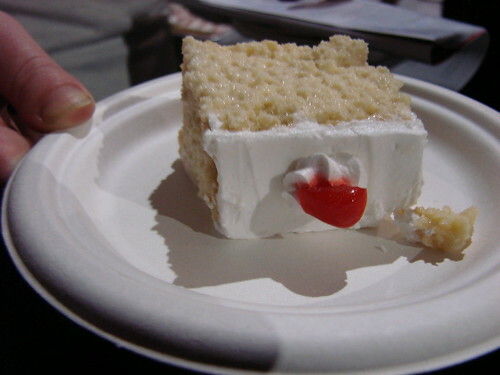 And now for the surprise, I can't even believe that I had enough room for one last bite, the cherry varenyky from Cafe Glechik in Brooklyn. I should have said no. I should have stepped away, but I'm a sucker for sour cherry and these tiny varenyky did not disappoint. 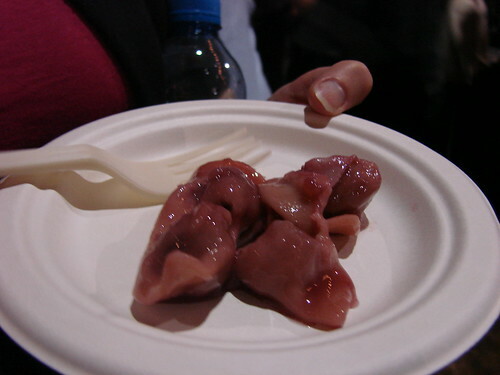 Each wee dumpling was stuffed with two perfect sour cherries. Not too sour, not too sweet, it was a perfect finish to a fantastic event. For those of your who missed the event this year, don't miss out next year. $45 general admission includes all the food (not to mention booze) you can stuff yourself with in 3 hours. You won't walk away hungry or disappointed. 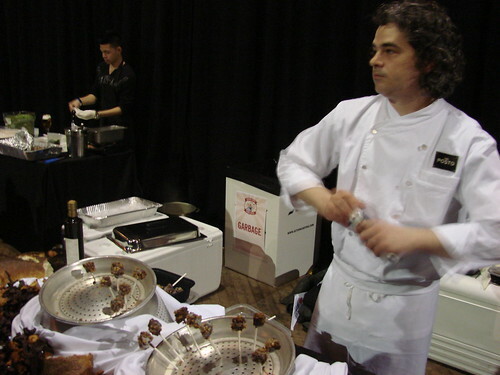 For more on this year's Choice Eats check out The Village Voice's coverage round up. did you get first dibs for being the token pregnant girl? thanks for the pie last night. it was chai-a-riffic. @steven: glad you enjoyed the pie!